LAS CRUCES, N.M. – Meeting for the first time in several years for a non-conference match, the New Mexico State men’s tennis team earned a 4-3 win over former Western Athletic Conference foe Utah State on Saturday, Jan. 25. 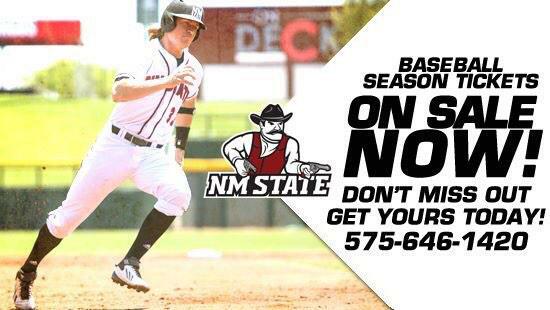 NM State improves to 1-1 after opening weekend of the 2014 season. The Aggies dominated the singles matches, winning four of the six, but were defeated on the doubles courts with USU claiming wins at courts 2 and 3 for the point. Senior Marc Westgate and sophomore Liam Goldberg teamed up for the Aggies lone doubles win 6-5 at the No. 1 doubles spot. Redshirt sophomore Paul Denele and junior Germain Degardin lost in a close 6-5 match at the second court and Sophomore Strahinja Trecakov paired up with freshman newcomer Charles Baron for a 6-3 loss at the third court. In singles play, Denele, Degardin and Goldberg each won in straight sets with Denele coming up with a 6-5, 6-1 win over Dennis Baumgartner at the top spot. Westgate took his match to a fierce three sets before claiming the victory (5-6, 6-5, 6-4) at court 2. The Aggies two singles losses came at the bottom two courts, but not before Trecakov battled to a 6-5, 6-5 loss at the fifth spot. The team now heads out on the road for four straight matches in Las Vegas, Nev. The Aggies meet host UNLV on Friday, Jan. 31 before meeting UC Riverside and Southern Mississippi on Saturday. The team wraps the weekend with a match against Weber State on Sunday, Feb. 2. Vote for NMSU in 6th Fan Contest win prizes!